Dogs XL Rescue is based on the fundamental principle that every dog deserves a chance for happiness. Due to a dedicated team of volunteers and supporters like you, more than 2,000 dogs have transitioned from scared to sensational, raggedy to ravishing, and forlorn to fabulous. On May 17th, 2015 the Dogs XL team was challenged to put this principle into action. 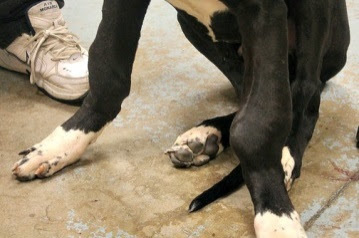 A high-volume city shelter asked us to take in an owner-surrendered 5 month old Great Dane puppy. If we didn't take him in, the shelter would euthanize him that evening. The puppy could not stand. His leg joints were twisted and inflamed. He could barely lift his head. We could have looked away but we did not. We named him Mayday. Mayday is a universally recognized distress signal and when we saw Mayday we knew we had to help him. In the end, we could not save him. He had aggressive bone cancer and his health declined very rapidly. People may ask - why try? 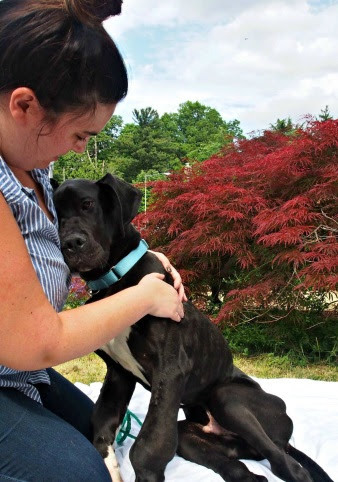 Why take a chance on a broken down dog with unknown health issues? Our answer is simple and beats true in the heart of all animal lovers: Every dog deserves a chance for happiness. As a Dogs XL dog, Mayday got a chance to know love. He got to sleep on a soft bed with a loving foster mom curled up next to him. He got to eat tasty food. He got a chance to get into puppy mischief. He got the opportunity to share his love with us. To celebrate Mayday's life and the indelible mark he made on so many people, we established THE MAYDAY FUND. Despite the heartbreak, if asked to help Mayday again- we would do it in a heartbeat - but we need YOUR financial support. The Mayday Fund enables us to help dogs that have expensive and extreme medical needs and to provide hospice support for dogs that have exhausted medical options. If you've been following Dogs XL for some time you know that Mayday was not our first foray into special needs dogs. The Mayday Fund will allow us to take a chance on the dogs that no one else thinks are worth the time or the money - dogs like Mayday. We know you believe, like we do, that all dogs deserve a second chance - none more so than those sick or in pain - and with your support we can do just that. Life is short but all of us deserve an opportunity to experience joy, even if it is only briefly. We know that we can count on you to stand with Mayday and the many dogs that will benefit from his legacy. Thank you for helping to bring joy to those who have known only suffering!